How Real Are Fresh Claims That Oil Reserves Are Being Overstated By One Third? The growth in OPEC reserves, without any corresponding discoveries, is an issue The Oil Drum has talked about various times. I know I talked about the issue about two years ago, in an article called The Disconnect Between Oil Reserves and Production. 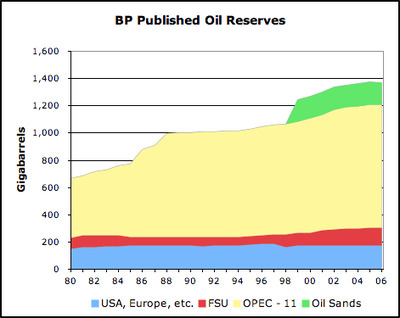 This was a graph I showed at that time, of published oil reserves. The FSU corresponds to the Former Soviet Union. The OPEC 11 is the 11 countries that were members of the organisation of Petroleum Exporting Countries at that time. (Membership changes over the years a bit.) As one can see, the vast majority of the reserves are those of OPEC–but these are not audited. The reserves the Telegraph article is talking about are “conventional reserves”–that is, reserves of liquid petroleum, not very heavy reserves that need to be melted, so would leave out the “Oil Sands” reserves in Figure 1. 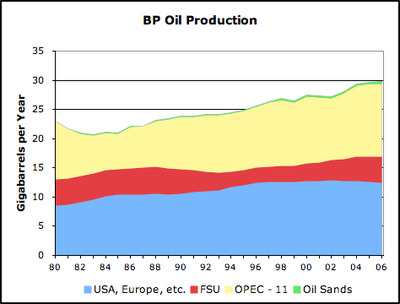 Based on the 2008 analysis, Figure 2 shows the distribution of oil production is quite different from that of the reserves. There is virtually no production from the oil sands, compared to their huge reserves. 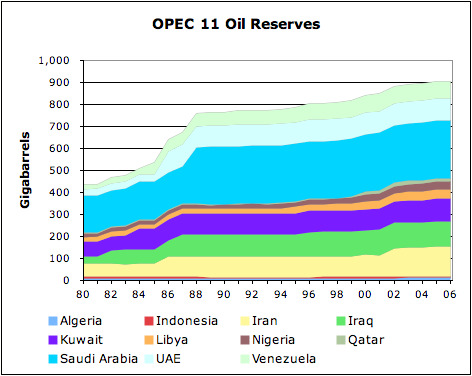 OPEC-11 also has much less production in comparison to its reported reserves. 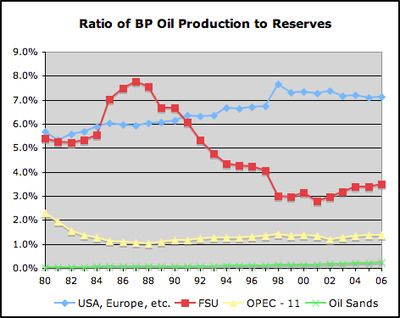 Figure 3 shows that when one calculates the ratio of oil production to oil reserves, one gets very different ratios for the four groups shown above. The oil sands, because they have to be melted, can only be produced very, very slowly. OPEC also seems to have low production compared to reported (unaudited) reserves. 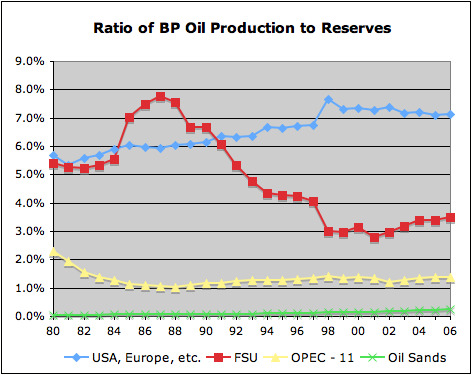 When one looks at the history of OPEC reserves shown in Figure 4, one can see they were raised very substantially in the 1980s, without any corresponding reported new fields being found, apparently because countries were at that time vying for production quotas, and higher reserves might have allowed greater production quotas. The reserves have not been reduced in recent years, even though oil has been extracted from these fields, tending to add further to questions about these reserves. Some might ask whether higher oil prices could lead to higher reserves. If we are talking only about conventional (that is liquid) oil, located in the Middle East–not under some deep sea somewhere–it seems unlikely that higher price would have much impact on reserves. Pumping these reserves wouldn’t seem all that expensive, so a higher price of oil shouldn’t have too much impact on the amount of reserves. The UK Telegraph article is related to a peer reviewed article soon to be published in the journal Energy Policy. The article is titled The status of conventional world oil reserves—Hype or cause for concern? by Nick A. Owen, Oliver R. Inderwildi, David A. King. In reality, much of the disagreement can be resolved through clear deﬁnition of the grade, type, and reporting framework used to estimate oil reserve volumes. While there is certainly vast amounts of fossil fuel resources left in the ground, the volume of oil that can be commercially exploited at prices the global economy has become accustomed to is limited and will soon decline. The result is that oil may soon shift from a demand-led market to a supply constrained market. The capacity to meet the services provided by future liquid fuel demand is contingent upon the rapid and immediate diversiﬁcation of the liquid fuel mix, the transition to alternative energy carriers where appropriate, and demand side measures such as behavioural change and adaptation. The successful transition to a poly-fuel economy will also be judged on the adequate mitigation of environmental and social costs. • The age of cheap liquid fuels is over. A condition of meeting additional demand is to develop unconventional resources, which translates to an increase in the price of petroleum products. • Oil reserve data that is available in the public domain is often contradictory in nature and should be interpreted with caution. • World oil reserve estimates are best described by 2P reporting. This means public reserve ﬁgures should be revised down-wards from 1150–1350 Gb to 850–900 Gb. • Supply and demand is likely to diverge between 2010 and 2015, unless demand falls in parallel with supply constrained induced recession. • Reserves that provide liquid fuels today will only have the capacity to service just over half of BAU demand by 2023. • The capacity to meet liquid fuel demand is contingent upon the rapid and immediate diversiﬁcation of the liquid fuel mix, the transition to alternative energy carriers where appropriate, and demand side measures such as behavioural change and adaptation. • The negative effect of oil price on the macro-economy is signiﬁcant, and should be used to build the business case to invest in alternative energy carriers. Many alternative fuel carriers also present the double dividend of improving energy security (i.e. utilise local resources) and reducing emissions (i.e. electricity, hydrogen).